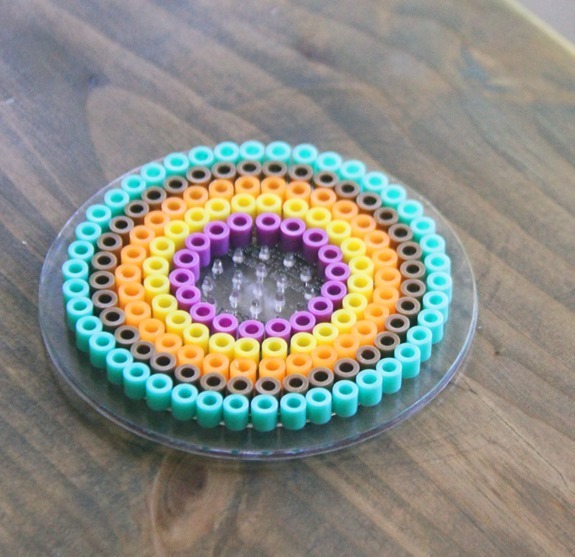 My son made me this Perler bead trinket last week…and it was the perfect color inspiration for a new fall quilt! Because the 5 fall quilts I’ve already made just aren’t cuttin’ it…. ahem. 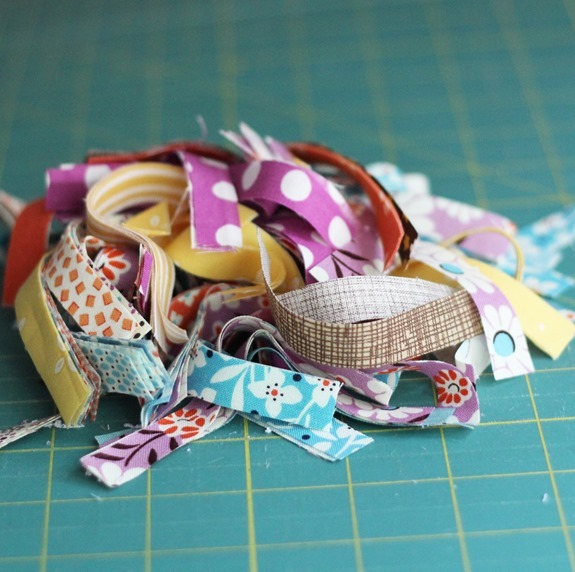 So a stack of fabric turned into a pretty pile of scraps before anyone could notice I was making another fall quilt. This will be the third quilt I’ve ever (ever ever) made with purple in it…and it’s growing on me. Especially with aqua, orange, and brown in there too…it’s a pretty combo. We woke up to a fun surprise this morning….6 new baby bunnies hidden in that nest!!!! It was better than Christmas morning at our house. Just leave a comment on this post and in 8 weeks a baby bunny will be delivered to your door step. Beautiful fall colors…for ]NOT EVER enough] fall quilt :). I will totally take a baby bunny. We will name it Cluck Cluck. Well, my daughter may have something to say about that…But we are seriously looking for a bunny or TWO!! Hahaha you're cracking me up over the bunny thing. I have a bunny and love it. Good luck with your ahhh, bunny collection. Your son is picking up your styles :) As for a bunny, we'd take one if your husband is willing to bring it to MN. Our 4 & 5 year old would be THRILLED beyond all belief. I love your post for 2 reasons. My daughter loved playing with Perler beads, and I still have many examples of her handiwork. (I must say that your ironing skills are better than mine though.) Secondly, I love those baby rabbits!!! We have two adult bunnies already, but I remember them when they were sweet, fuzzy babies. No, I don't want any more rabbits! Oh, I want a bunny so bad! I've been trying to talk my husband into getting one. :) for our kids, of course. You had me at fall quilt, and then you had to go and have baby bunnies too?!!! I'll take a bunny, if you'll hand deliver it to Oklahoma so I can sit and chat about all things quilty with you. HA! LOL, sign me up for a bunny! Hilarious. . .a good thing my daughter doesnt read your blog… she'd leave a thousand replies! despite a Bunny not surviving International Post restrictions. Love your colour combo's. Very restful. More pictures of baby bunnies please!! At the risk of winning a bunny…The old ladies who taught me to quilt were firm in their instruction that every quilt should have a little bit of purple in it. Now I've inherited a quilt's worth of purple fabric from my mil. I think I'll have to split it up, a lot! Love your fall colors. You taught your son color choices well. Awe…bunnies. Do not track me down. I have two dogs that unfortunately would think that bunny is a snack. Good luck finding them all homes, I am sure it won't be that hard. No bunnies yet please! We'll take one of the next litter (is that what "batches" of bunnies are called?) when my little boy is a little bit bigger and we're living in the country! 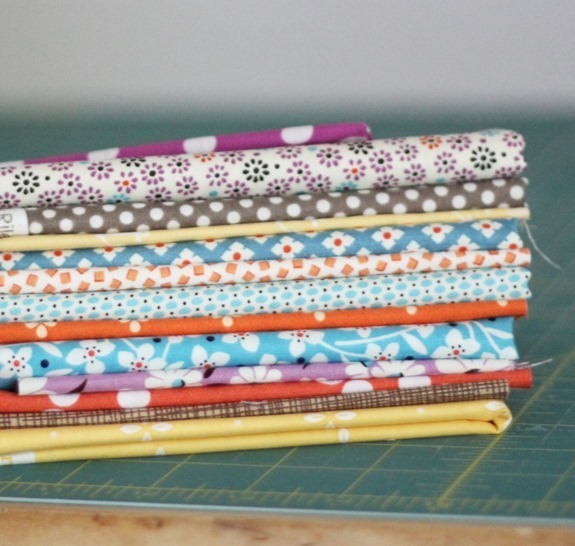 I'm thinking of still doing a modern maples quilt before fall… That stack of fabrics gets me enthused! I love fall and everything related to it! Your quilt is darling and your bunnies too! Can't wait to see the blow-by-blow pictures of the bunnies over the next two months! I think we need at least a weekly update – you could call it Bunny Day! I want to see more pics of these baby bunnies! Were you expecting thenm? or a complete surprise? Just in case you make this a giveaway, though (because I never win ANYTHING) – what is the breed of your rabbit? I seriously fell in love and would love to own one. Best post ever! Laughed myself silly. Pretty colors! Some of the combos my daughter comes up with for her Perlers are amazing! It's easy to be fearless with color when you aren't bound by any rules! I absolutely LOVE purple! Happy you have chosen to put it in with your fall colors! Looking forward to seeing the results of that beautiful fabric! I'm crushing on a Churn Dash. But not on a bunny. I had one when I was in my 20's and lived in Germany. Every time I got near it, it bit me. German bunnies don't like me ergo bunnies don't like me! great range of fabrics for the fall quilt and nice to have been inspired by your son when choosing the fabrics. Will be fun to watch the baby bunny antics, sure they will keep you amused. Not a huge purple fan but that color combo is pretty! Cant wait to see what you make! As for the bunny…I wanted one but we ended up with a puppy. Somehow Im thinkin a bunny w babies wouldve been easier!! Love the bright fabrics you chose :) I would love a bunny,, too bad there's a rule, only one pet per appointment. Love your son's color choices! (he takes after his mom, right?). If your husband is willing to make the trip to Holland, he'll be welcome to bring me some bunnies for my grandchildren. I really hope he's not that desperate!! Bunny? Mine passed away two years ago and I haven't chosen a new one yet… but your fuzzy grey bun is gorgeous! Enough people have now commented that I think I'm safe enough from imminent bunny arrival to say how gorgeous those colours are. There's a little bit of a good 70's vibe about the purple and yellow mix and I think it's going to be fantastic, very autumnal without needing to be all orange leaves, more ripe quince and damson jam! LOL! My daughter want a bunny like foreverrrrrrr. And she was just learning how to spell it and now she is signing chanting , I want a B U N N Y! Isnt the B U N N Y going to be so CUUUTTTTEEE! I have most of that stack of fabric! I've been collecting DS Quilts collections to use in a Farmers Wife quilt. I'm just about ready to start working on it. Your bunnies are so cute. Can't wait to see pics of the babies. Baby bunnies! Please post pictures when you can… there's nothing cuter than baby animals. Can't wait to see your new fall quilt. And really, can there ever be too many quilts? Nah! LOL….looks like you're going to need a few more bunnies! Lots of us want a baby bunny! LOL! Seriously though, I'll be watching for your husband to bring mine to my doorstep….Glendale, AZ! PS……love the colors in your fall quilt! bunnies!!! such a great stack of fabrics! and I love the peek at the church dash quilt on your wall. OH! I spy Denyse Schmidt lovelies in that stack. Three cheers for new quilts and baby bunnies! Welcome little bunnies – we would love to see you! 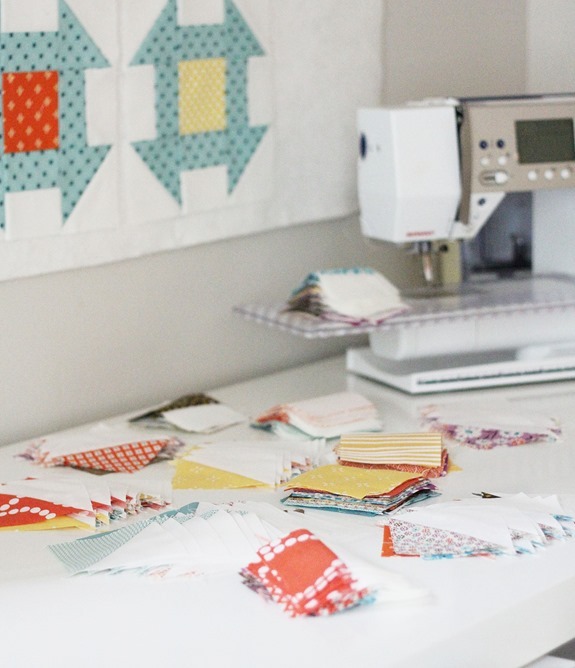 Your fabrics and the new project looks beautiful! Hi!!! Hee hee too funny!!! I bet they are precious!!! Love the colors for fall!!!! That purple works so well with the other colors you have!!! Very pretty!!! Thanks for the fun!!! Love your take on fall colors! Great colour combo!! And the bunnies?? Just as well I live Down Under!! I love chickens myself. Could never understand about eggs and bunnies. I have never heard of a bunnie laying an egg! Love my chickens. Would love for you to make a churn dash pattern. I wasn't going to comment for fear a bunny would be delivered, but you have so many takers that I know I'm safe here in Boston! Good luck! Love the fabric by the way. If the baby bunny is delivered in one of your *extra* fall quilts, I will give you my address! Seriously- I love the fabrics you used in this latest one! Inspiration can come from anywhere! and the Bunny is so cute!! I bought allot of those same fabrics a few weeks ago, so there are some orange and blue/turquoise projects in my future, too. (I really need a case for my crochet hooks—that is first up.) No bunnies, please—when I bought my dog, the woman's husband was trying to get rid of a litter of kittens. He kept teasing me that all puppies came with a free cat, so when my dog is naughty, I tell her that I should have left her at the farm and kept the free kitty. My husband would be able to relate to your husband. Sadly, bunnies will not be allowed through Australian quarantine. Those really are beautiful colors together! Perler beads are so fun and wonderful inspiration :) Your bunny is adorable, I know my son would LOVE to have one of the babies, but our dog may not! I don't want a bunny but I love that Churn Dash quilt you've got going on in the background! Too cute. I do so wish I could be a good parent to a sweet bunny. I did enjoy bunnies when I was young, as well as helping to take care of a neighbor's bunny when they traveled. If I didn't travel so much I might just ask for one of your bunnies. I'm sure you'll find great homes for these guys, but if you need more PR for finding good homes, just let me know. 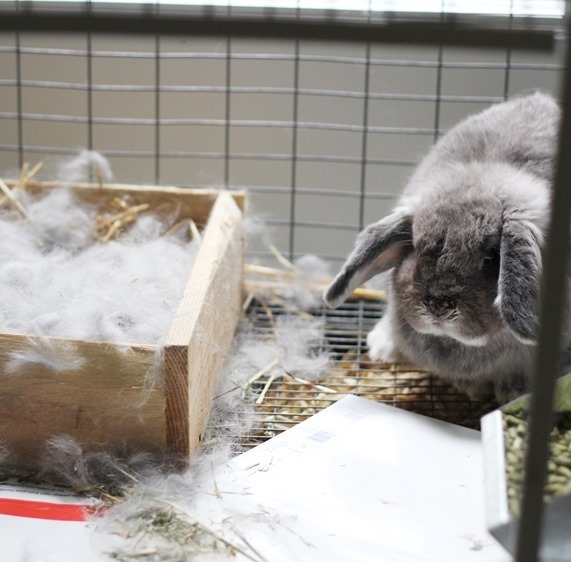 Uh oh, you better get another hutch (or two)! We had two rabbits growing up that quickly became over 20 at times. Our original two were Flopsy and Peter. Peter turned out to be the mommy, what a surprise that was! Sounds like you are enjoying them, and your kids are too. someone mentioned houston, you could drop one off to me on your way there! the grandkids would love one! I love your fabric choices (better yet your son's bead choices for fall colors, very pretty.